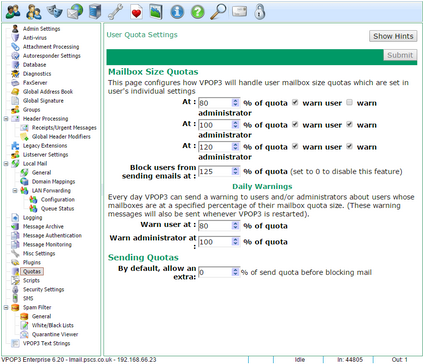 This page lets you configure how VPOP3 handles quotas. Individual user quotas are configured in the user's setting's Quotas tab, not here. Mailbox size quotas set a limit on how big a user's mailbox may be. This can be useful if disk space is limited or you have users who do not manage their mailboxes very well. 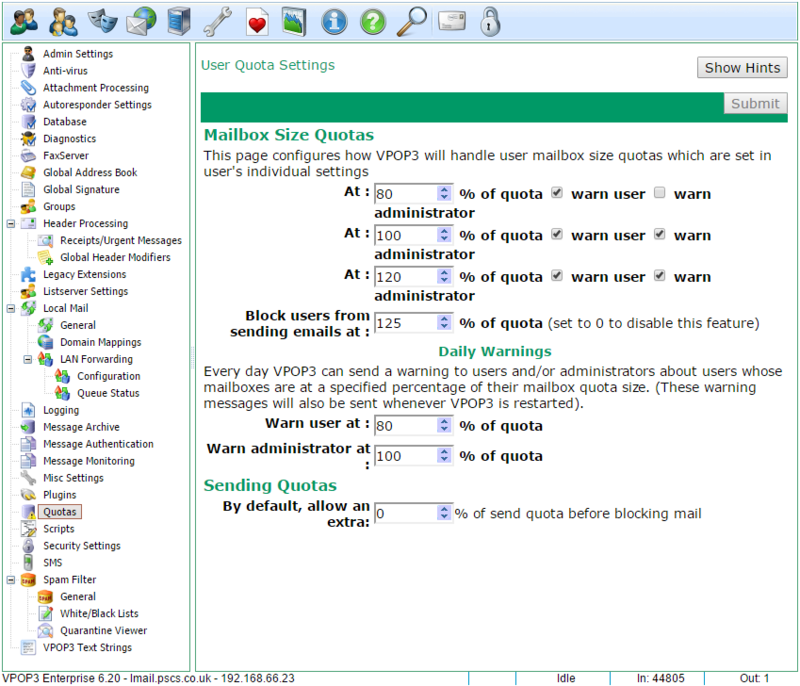 In VPOP3 mailbox size quotas do not block incoming mail as they do on some systems. This is to prevent important messages from being lost. Instead users and administrators will be warned that the mailboxes are large, and you can optionally tell VPOP3 to prevent the user from sending outgoing mail (as an extra 'encouragement' for them to delete some messages). •When the mailbox grows above 80% of the configured quota size, the user will be sent an email telling them of this. •When the mailbox grows above 100% of the configured quota size, the user and administrator will be sent an email telling them. •When the mailbox grows above 120% of the configured quota size, the user and administrator will be sent a further email. Then, you can tell VPOP3 to block the user from sending messages at a certain size. In the above screenshot the user can't send messages if their mailbox grows above 125% of the configured size. If you want to disable this feature, set this option to '0'. As well as the warnings when a message grows over a certain size, you can also tell it to send a daily message if the mailbox is still over that size. You can set the trigger sizes separately for users and the administrator. NB - the administrator who will receive the warnings is the administrator who is selected in the MailboxQuota target on the Message Targets list. This defaults to the Main Administrator. Sending quotas let you specify how many messages a user can send in a specified period. On this page you can specify an extra allowance on any configured quotas. (This is normally not needed as you can simply increase the user's sending quota, but the feature was requested, so it's here).